Do you want to sleep in Menorca among Mediterranean fragrances with a background of wild olive and rosemary, lavender and bitter almond? 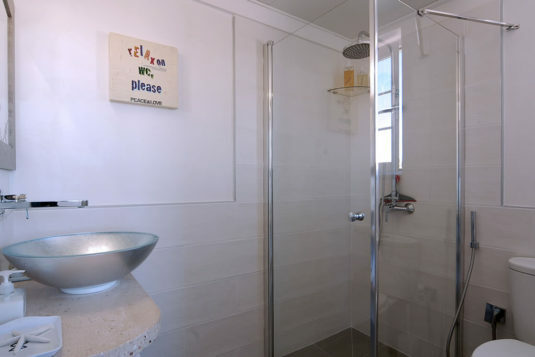 Choose a room with private bathroom such as Einstein, Confucio, Picasso. Breathe in a reassuring, authentic atmosphere that invites you to live in harmony with your true self. Ideal for families or lovers of space. Einstein is a junior suite with double bed and single bed and a private bathroom en suite. It is the only room with bath and shower. With beautiful furniture but never over the top. Attractively decorated; white and grey being the dominant colours. On the floor, enamelled porcelain stoneware and vintage wood effect. It is the only room of the Guest House with two single beds that, in the double version, become a comfortable King Size bed. 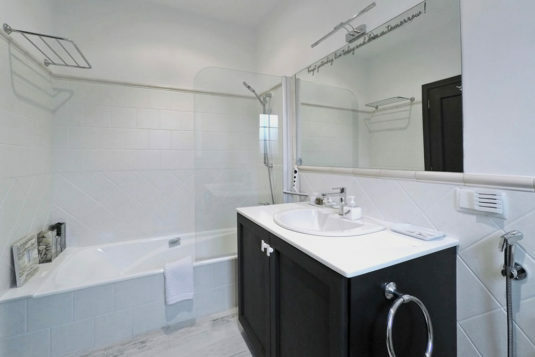 Minimal style, pleasant and elegant with an en suite bathroom with shower. Have you seen? The knobs of cabinets and drawers are all different! White towels for the bathroom, grey for the pool and the sea. White and grey covers also for beds with several sets of cushions. 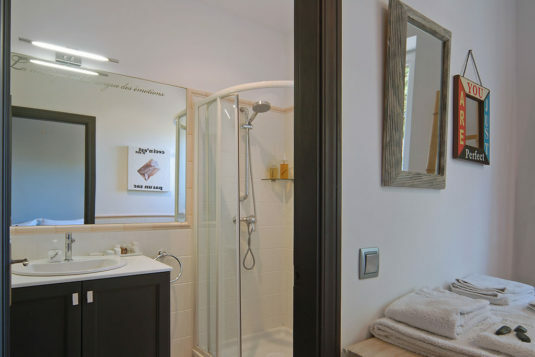 It is the smallest, the most romantic, the newest of the three rooms with private bathroom in Casa Bonita: it is a tribute to Pablo Picasso. We designed it with love, paying attention to every detail. It has a 150 cm wide “Spanish” double bed. White ordinance and cosmopolitan style for Picasso. 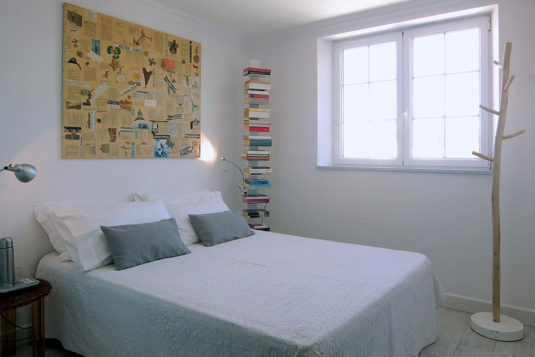 With books and simple furnishings that allow us to fully enjoy the beauty, inside and outside. Each window of our home is a picture and the exceptional nature of Menorca tells ancient and legendary stories. Would you like to listen to them in the silence and the peace of Casa Bonita?